With just a few days remaining to the awesome promotion “Daily Deposit Bonus up to 200%”, we are on the verge of withdrawing this wonderful promotion. So, we thought, it might not be such a bad idea to remind yourself once more about this awesome opportunity to double up your cash. Depositing cash is pretty simple and safe process @ DeccanRummy. Click the “My Account -> Add Cash” after login. Enter the amount of chips that you want to purchase and press the “Add Cash” button. A minimum of Rs 100 must be added in a single transaction. Transactions below Rs 100 cannot be processed. After entering the amount, you will then be redirected to our payment partner where you can securely complete the purchase. After the payment processing is successful, you would be provided a transaction reference number. Please note this down for future correspondence. 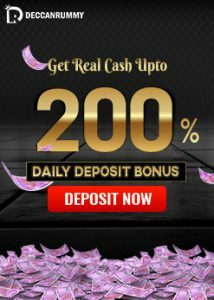 Upto 200% bonus offer would be automatically applied on the first deposit you make in a day. As mentioned earlier, you can get upto 200% on your deposits. For eg: if a player deposits Rs. 100 in his account, then he has the chance to earn upto Rs. 300 as returns. This means players can play more cash games and extra cash bonus which they can use to increase their winning amount. Sounds scrumptious, right? Players who are hesitant to play high stakes game can use this exciting promotion and spend the bonus amount earned to play cash games. We have already mentioned the benefits of playing high stakes games which you can view by clicking here. 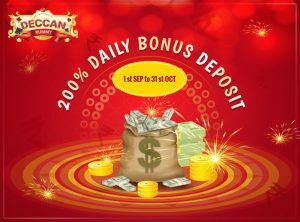 Cash games are also going to fetch you Deccan Points (aka) Loyalty points which can be used in for various purposes, in addition to the huge cash you will stand a chance to win. As this offer is applicable only for the first deposit a player makes in his account, Players must deposit everyday to derive maximum benefit out of this exciting promotion. With just a few days remaining, all our players are invited to make optimal use of the given opportunity. We have already received an overwhelming response from many players. Earning money is never a difficult task at DeccanRummy. We give numerous opportunities for our players to earn cash much more than their expectations. The offer is valid only on the 1st Deposit made by the player on any given day. Subsequent deposits made by the player on the same day are not eligible for the offer. DeccanRummy tournaments give the players perfect opportunity to earn some cash prizes in quick time. Tourneys allow you to exercise your full rummy skills in front of different opponents across the country. Not only would your rummy skills enhance but you are provided with a thundering opportunity to win real cash. We allow you to double up your celebration by allowing you to earn some exciting cash awards by playing these thrilling tourneys. Our tournaments are well structured and easy to play. We offer the right mix of excitement as well reward for these tourneys. You might even want to try our Special free roll tournaments we are conducting on these festival days. Do not worry! Our free roll tourneys are not going to end just with this. We have free roll tournaments running every day and you might have fun joining any of our tourneys. Our free roll tournaments offer lots of cash prizes, free gold etc. Players can flock in every day, register for free and win these amazing prices without paying any entry fee. As the entry is free, people are in a rush to grab their seats. So, we request you to login to your accounts a few minutes the registration begins, so that, you can book your place well in advance. Players can learn about the general rules on how to play rummy and details about the value of points for each card by clicking here. We are sure you do want to know about the five effective Rummy strategies, as well. Cash tournaments are those tournaments wherein the player would be required to pay an entry fee to join the tables. Compared to our peers, DeccanRummy charges less for all the cash tournaments. No Pain, No gain must be your mantra. Do not get bogged down if you lose a couple of tourneys. There are practically no limitations on the number of attempts a player could make. Never give up! If you don’t win the game today, there is always a tomorrow. 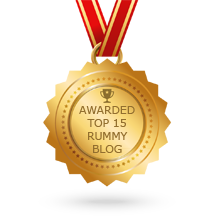 We have been getting a lot of questions of late on the effective strategies required to win rummy games. So, we take this opportunity to present you “Five Effective Rummy Strategies” which would be very helpful going forward. By this time you must know that Rummy is a game of skill. Mastering the game is not so difficult task as playing practice games in our website would really enhance your rummy skills. The rules are straight as an arrow. You will have to arrange the 13 cards dealt to you in sets/sequences. For that, you need to pick up a few strategies which would be of real help. Most of the players would pick up these strategies as they play. The first and foremost objective that should be running in your mind is to aim for the pure sequence. Because if you have a pure sequence in your hand, it will not get counted as points, if in case your partner declares before you. The moment you sort and arrange your cards, the first thing you should check is that whether you have a pure sequence or not. If not, then your first step should be to meld a pure sequence. Eg; 3, 4, 5 of spades is a pure sequence. What to discard? Cards like Jack, Queen, King & Ace carry 10 points. If they remain ungrouped when your opponents declare rummy, you might then lose with heavy points. Discard the high-value cards that may not be useful to meld sets and sequences. Note: Do we need to discard such high-value cards every time? Absolutely not!! There lies the strategy behind Rummy. If you see your opponent picks up any card you discard, then chances are that he is trying to meld a sequence with those. You must hold your higher value cards in such cases to prevent your opponent from melding sets/sequences with them. Eg: For example, if you discard queen of diamonds and your opponent picked it, chances are high that your opponent will also pick jack of diamonds so you should think twice or thrice before discarding jack of diamonds even if you want to reduce your points. The idea behind this is to carefully observe cards that the opponent is picking/discarding and make your move accordingly. As mentioned earlier, you must keep track of what cards your opponents are picking/discarding. If you do it, you can have a clear idea of what cards your opponent is holding. You can then sit back and bait your opponents. The first step to confuse your opponents is picking few cards from the open deck and discarding low-value cards initially. Your opponents may think that you would declare the game anytime and discard cards in a hurry, which might help you on occasions. Rummy Experts often employ this strategy to defeat their customers. Also, try to throw a few cards as bait and see if your opponents are picking it up. Joker is an easy way to meld your cards into sets and sequences. It is considered as a jackpot in the game of Rummy. If you have a pure sequence and a joker too, you should try to use that joker to make the second sequence by using that Joker as the idea is to meld all the hand cards into sets/sequence quickly. Also, the trick to using a Joker should also revolve around reducing the points so if you have a King and queen of hearts vs. a two and three of diamonds, you should use the joker with King and queen of hearts so that you would get points only for two and three of diamonds. We are sure some of the tips and strategies offered here would come in handy for the player at times. At the end of the day, the amount a player earns is entirely dependent on the player’s skills. True to the saying “Practice makes a man perfect”, if you practice the game of rummy using the free 10000 practice chips offered then chances are that you might even develop your strategies on how to win. New visitors can always join us anytime at our website. It’s been a whole month of non-stop online rummy action here at DeccanRummy.com. 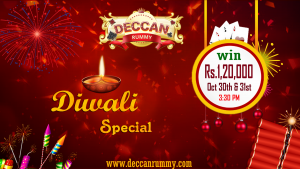 It’s Diwali season and it’s now fireworks at DeccanRummy. We have seen players eagerly registering their names to participate in our freeroll tourneys. And to our astonishment, these free roll tournaments surprised many players with more than expected cash. We must say we are simply overwhelmed by the stunning response. Keeping our players happy has always been the top priority of DeccanRummy. Diwali is a festival of lights and happiness. It’s the time of year where everyone is bustling with enthusiasm & exuberance. We are out to make this Diwali a grand affair by scheduling two exciting tournaments. As the saying goes “Make hay while the sun shines”, Players must grab these opportunities with both hands. DeccanRummy would like to invite you all to participate in this exciting tourney make optimum use of the given opportunity. Give a shout out to everyone in your circle about the humongous cash prizes on offer. 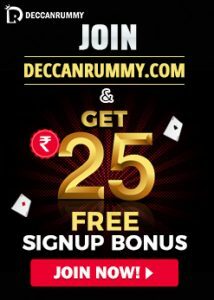 Refer your friends, relatives to DeccanRummy and earn cash bonus. Make them add spice to the non-stop entertainment here at DeccanRummy. Also check the wide range of existing rummy bonus offers and promotions.